Description: The 2007 Railroad Dze display train pulls in past B12. Description: The 2007 Railroad Dze display train pulls into the display area. Description: I was actually surprised to see these here. Description: I didnt think these would come here. Description: My first shot of the new "eco-friendly" locomotive. Notice 2 of the motors are running, the 3rd is not. Description: A green goat switches around the 24th St. interchange. One motor running, 2 not. 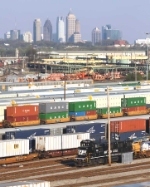 Description: The Atlanta skyline looms in the distance over NS Inman Yard. Description: A newbie handles switching duties at Inman Yard.